I've been window shopping online a lot lately, trolling the Internet for the best stuff out there for YOU (because I shop better when not shopping for myself)! I've put together a list of my favorite fantasy shoes on sale at Saks, who have been doing great markdowns - sometimes up to 70%- lately. Hot trend in shoes? Hot colors - purple and pink! 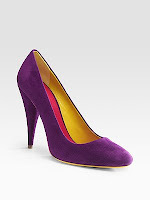 and...if you have $531.90 laying around, the YSL colorblocked ones are all yours!